Finally an awesome solution to protect your displacement hull/race paddle board. The Riviera Paddle Surf Race Paddle Board Bag is made to specifically for racing boards. It's a wall bag so it can accommodate thick displacement shapes. The walls also have cinch straps that allow you to tighten down the sides to adjust for a perfect snug fit. 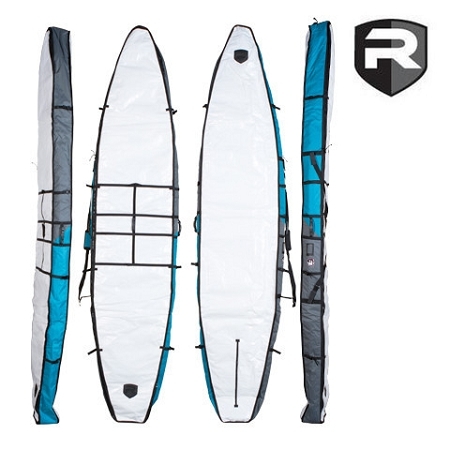 The Race Paddle Bag comes in 3 sizes 12'6, 14' and 18'. The top of the bag has a white nylon surface that handles direct sunlight well. If it's really hot the Riviera Paddle bag has a solar reflective material on one side to keep the temps down inside the bag. The inside of the bag is covered with a tarplin material that handles water well. You can store fins or other small stuff in the inside pocked that's built in to the liner of the top of the bag. 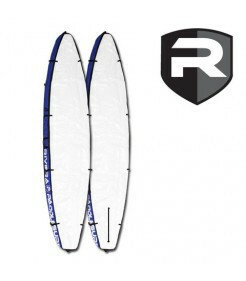 The zipper fin slot lets you choose whether to travel with the fin on the board or off. Carrying the board in really easy due to the molded handles. Riviera put 3 molded handles, one in the middle wall, and one on each end of the bag. All and all, the bag is made very well with a lot of cool features you would want in a paddle board bag! !